My garden is plagued by rabbits. They love my pole beans when they are first coming up and they think my greens are their own personal salad bar. I tried a lot of things to get rid of rabbits without success, and I finally decided that I was going to have to build a fence. But, I have several problems with the idea of a fence. For one thing, my garden is constantly changing size and shape, so I hate to lock myself into a specific area for gardening. 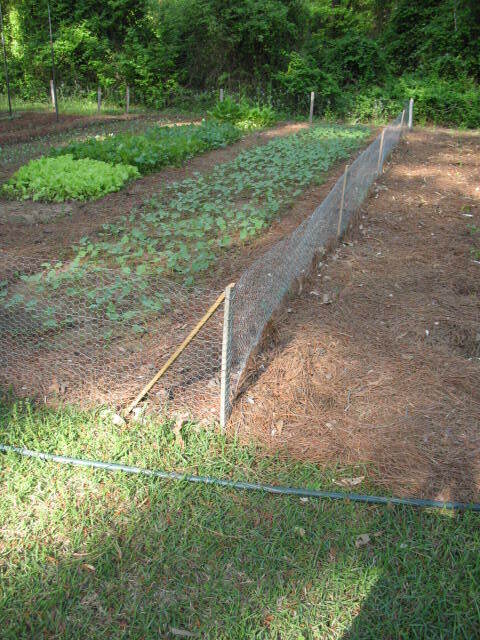 For another thing, many of the things I grow don’t seem to attract the rabbits and don’t need to be fenced, but I rotate my crops to different parts of the garden each year, so I would have to build a fence around all of my crops whether they needed to be fenced or not. And lastly, to keep rabbits out I would have to build a fence out of the smallest (and most expensive) welded mesh wire. I thought about it for a while, and finally decided that what I needed was a fence that I could put up around the crops that need a fence, but that could be easily taken down and moved when the location of those crops was moved. So, I developed my slightly ugly, but highly effective portable anti-rabbit fence. For fence wire I chose 2 foot high chicken wire. It is relatively inexpensive and has a small enough weave that rabbits can’t get through it. For posts I ripped a bunch of 3 1/2″ cedar fence pickets in half, cut them three feet long, and sharpened one end to a point. You don’t have to use fence pickets. I just happened to have a lot of old fence pickets lying around. You could cut small saplings, use PVC pipe, old re-bar, or just about anything for the posts. Once you have your posts in hand you can use a hammer to drive them into the ground around your crop. I drive them in about 6 or 8 inches and put them about eight feet apart. One hint; don’t place the posts too close to your crop. Leave yourself plenty of room to work. Now that you have the posts in place, it’s a simple matter to take some tie-wire or other light gauge wire and wire the fencing to the posts. I put one loop of wire at the top, in the middle, and at the bottom of each post and give them a couple of twists with pliers to keep them tight. You’re not building the Great Wall of China, so don’t wire the thing together like it’s going to be there forever. Make sure that you have the bottom of the fence wire down on the ground. If you leave any room, those rascally rabbits will sneak under your fence. If the fence is too loose at the bottom, you can use coat hanger wire or bailing wire and make stakes to hold the bottom of the fence down. I put mulch down on both sides of the fence so I don’t have to mess with weeds. Now you have a (hopefully) rabbit-proof fence around your crops. It’s only 2 feet tall so you can easily step over it to get into the garden and work. Next year when you move your beans and greens to another location, you can move the fence along with them. Rabbits also seem to love broccoli, Brussels’s sprouts, and other plants when they are young. I build little round cages out of small mesh welded wire to put around these types of plants. The cages are about a foot across and a foot tall. By the time the plants grow up out of these cages they can pretty well survive on there own, plus spring is now well advanced and the rabbits have more choices of wild plants that are easier to get to than my caged plants.